CalTech researcher John Dabiri uses biomimicry to design cheaper, more efficient vertical axis wind farms inspired by schools of fish. Another example if wind energy are silent small wind turbines scaled to the right size for residential and urban areas have so far lived in the shadows of their larger wind-farm-sized counterparts. The power output has been too low for a reasonable return on investment through energy savings and the noise they produce is louder than most homeowners can deal with. A Dutch renewable energy start-up called The Archimedes is working to solve both of those problems in a new class of small-scale wind turbine — one that is almost silent and is far more efficient at converting wind into energy. 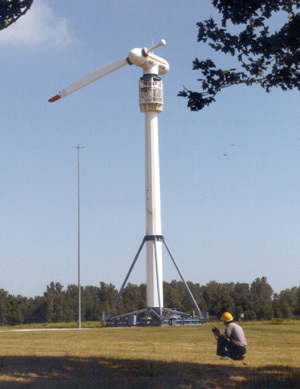 The company states that the Liam F1 turbine could generate 1,500 kWh of energy per year at wind speeds of 5m/s, enough to cover half of an average household's energy use.